A visit to Lockhart will surprise and charm you. Walk down wide shady verandahs and discover the life and times of Lockhart and district as depicted in over 400 images etched in the pavers of the ‘The Verandah Town’. Classified by the National Trust, Lockhart exhibits a fine example of typical turn of the century architecture. 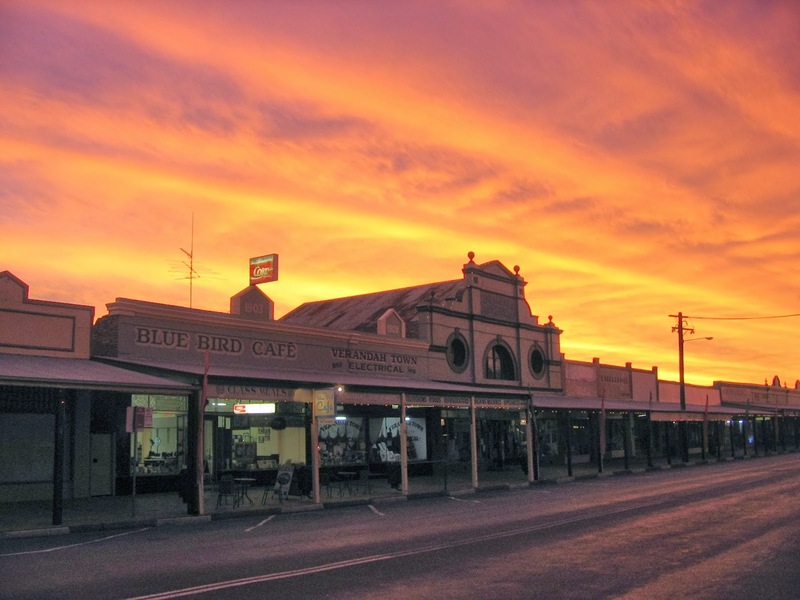 Situated 62 km from Wagga Wagga and 105 km from Albury/Wodonga, Lockhart was the Winner of the NSW Tidy Towns Award in 2009. Spend some time and discover features and attractions including beautiful parks, the Galore Hill nature reserve and bush walks; local art, shopping and dining or surround yourself in our history. Local businesses offer a unique shopping experience. Enjoy coffee or a relaxed lunch in one of Lockhart’s cafes, hotels or the Ex-Servicemen’s Club dining room. Set close to the historic main street, the Lockhart Water Tower Mural, depicting a cascading waterfall surrounded by many of the unique native fauna and flora found in the local landscape, has rapidly become one of the most incredible pieces of public art in the Riverina. Undertaken by talented Blue Mountain artists, Scott Nagy and Janne Birkner (Krimsone), who are well known artists in the public mural sphere, the artwork reflects the importance of one of the regions most vital assets – water. The artwork, covering a surface of more than 600m2, was created freehand using spray cans in natural hues to complement the Lockhart streetscape and to harmonise with the natural environment. The popular Spirit of the Land Festival is also the catalyst that inspired the wonderful sculptures displayed throughout Lockhart and the surrounding district throughout the year. While in Lockhart walk the ‘Farm Art Trail’, a unique collection of sculptures acquired by Lockhart Shire Council and other prominent supporters of the community. Many of the sculptures are winners of the National Farm Art Sculpture Awards, held in junction with Lockhart’s Spirit of the Land Festival, a celebration of the resilience of those who live and work on the land. This year’s exhibition, augmented by the town’s own collection of sculptures, promises to be just as remarkable as in previous years. Lockhart’s own Community Branch of the Bendigo Bank has once again pledged this year to help the town build its collection with the purchase of a new sculpture. The Pastoral Shadows of Brookong is a heritage trail located at the north-eastern entrance to Lockhart township. Designed by the Lockhart Progress Association, the Pastoral Shadows of Brookong reflect life during Lockhart in times long past. Once a large sheep station encompassing thousands of acres, Brookong Station of the 1880’s included the area where Lockhart stands today. Many men worked on this station as shearers, shed hands, rouseabouts, stockman, drovers and the inevitable man out of work, the ‘swaggie’. Depicting settlers, squatters, swagmen, horses, working dogs and sheep, who were the life blood of the area, and set in an area of native grasslands, the natural features of the metals used provide the necessary character, contours, shapes and shading to the various sculptures to create a glimpse of a bygone era. Washed, combed and undyed, Doris Golder OAM has used naturally coloured wool to create an amazing array of landscapes and portraits since the early 1980s. Doris spent over 14 years successfully creating these rare pieces of art, during which time over 30 portraits were completed. Each portrait required immense patience and took months to complete. Doris spent hours working with and carefully placing minute fibres of coloured wool over a background of fluffed and glued white wool until her subjects were perfect. From Slim Dusty and Greg Norman to Bob Hawke, Tim Fischer and many other famous faces, Doris has captured their very essence by using this unique and highly skilled medium. Requests to display the portraits were numerous, some even being displayed at the Parliament House in Canberra. In 1993, Doris completed her last wool portrait, retiring to Lockhart in 1996 before kindly donating her wool portrait collection to the Lockhart community in 2004. Now housed in the Doris Golder Art Gallery within the informative Green’s Gunyah Museum in Lockhart, the portraits and pictures created by Doris continue to enthral and amaze visitors and locals alike.